Jose Mourinho: Is this the end of the road for Chelsea manager? Chelsea's meeting with Liverpool at Stamford Bridge was billed as the game manager Jose Mourinho must not lose if he wanted to keep his job. Now, after a 3-1 defeat that sent Chelsea towards the bottom of the Premier League after their sixth loss in 11 games and left Liverpool fans singing "you're getting sacked in the morning", the grim statistics and questions are piling up around Mourinho. The end of the road for the Special One? Not in the eyes of Mourinho himself. He was asked after the loss whether he thought this would be his final game in charge and his instant response was: "No." While all eyes turned towards Chelsea owner Roman Abramovich, who always has the final word on these matters, Mourinho insisted his immediate plan was to go home "to find a sad family". He then wanted to watch the Rugby World Cup final between Australia and New Zealand - before mapping out Sunday's training session for the midweek Champions League meeting with Dynamo Kiev at Stamford Bridge. Abramovich is the great unknown factor in the debate surrounding Mourinho and whether he has any future at Chelsea. The Russian oligarch has never hesitated to act in the past, but here he is dealing with a manager who brought Chelsea the title only six months ago. And yet, there has been an unease around Mourinho since the start of the season, from the delayed return to pre-season that appears to have left his players off the pace, through the row with team doctor Eva Carneiro on the opening day of the campaign against Swansea when she angered him by going on to treat Eden Hazard, on to a run of results unprecedented in his glittering career. Mourinho has cut a troubled, tormented figure at odds with authority once more, recently fined £50,000 by the Football Association and given a one-match suspended stadium ban after comments about officials following the 3-1 home loss to Southampton. While those within Chelsea's boardroom may raise an eyebrow and have concerns about potential damage to the club's image - coach Silvino Louro and midfielder Nemanja Matic were also sent off at West Ham - the bottom line is results, and three defeats in a week is hardly a safety net for Mourinho as he clings to his job. The loss to Liverpool, something that always causes Mourinho particular pain, came after that defeat at West Ham and the Capital One Cup exit on penalties against Stoke. It was by far the most damaging because these are games Mourinho has specialised in winning. Chelsea are a results-driven club under a results-driven owner. That title win a few months ago may buy Mourinho time but no manager survives consistently poor results under Abramovich, irrespective of past record and reputation. Mourinho can at least count on the backing of Chelsea's fans. They chanted his name loudly and at length after Christian Benteke's goal confirmed this latest loss, making it clear who they want in charge and that they still believe Mourinho is "The Special One". The mood at Stamford Bridge in the immediate aftermath of defeat was calm - particularly in the light of Abramovich's recent backing for the manager. This was the first time Abramovich has ever made such a move and Chelsea's owner was 100% behind the man he brought back. It was a pledge made with real commitment. But it was also clear results had to improve and it may yet be that the next two or three league games may be the tipping points rather than this loss. Even then it may not be a case of Mourinho being dismissed. This is, of course, a possibility but it may even be that Abramovich could offer further backing to his manager when the transfer window opens in January. 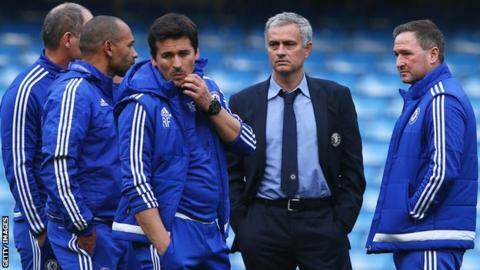 The lack of unrest among the paying public may play in Mourinho's favour as Abramovich makes his calculations. There is also no suggestion that the relationship between manager and owner has broken down, as it did when Mourinho left Chelsea in September 2007. Abramovich, however, has never appeared the sentimental sort and there can be no doubt this wretched, totally unforeseen sequence of bad results has put Mourinho in danger. As Chelsea's fans filed into Fulham Broadway it was all still up for grabs. Would Chelsea improve by sacking Mourinho? Again this is a question that would no doubt figure in the considerations within Chelsea's boardroom as they pore over the future direction of the club. There may be, as Liverpool are experiencing now with Jurgen Klopp, a bounce from a fresh face in the technical area - but Chelsea are currently under the command of one of the finest and most successful coaches in the world. Would replacing Mourinho, with his proven track record of success, improve Chelsea long-term? Would it not simply be an act of panic after the first run of this kind in a great manager's career? The difficulty Mourinho currently has to deal with is that, because of his own successes, this is a scenario with which he has never had to contend - namely providing the sort of guidance and approach that moves a team out of trouble from near the bottom of the table. It is new territory for Mourinho but it would be an insult to his intelligence and ability to suggest this was beyond him. There is no guarantee of a meaningful, long-term uplift should they get rid of him. Chelsea would be in danger of acting in haste and repenting at leisure. Who could they get to replace Mourinho? This would be another factor very much in Mourinho's favour if Chelsea owner Abramovich is seriously contemplating a change. Pep Guardiola has always been favoured by Abramovich but he is not going to leave Bayern Munich in mid-season and Chelsea's modus operandi, with that willingness to change managers with regularity, may not be to his liking. The same would surely apply to Atletico Madrid's Diego Simeone, a talented but hugely combustible character who might not reduce the stress levels should he take over from Mourinho. He is unlikely to leave La Liga at this stage of their season. Carlo Ancelotti is currently available after leaving Real Madrid but would the man who brought a historic Premier League and FA Cup double to Chelsea in 2010 really want to work for the club again after being unceremoniously sacked at Goodison Park at the end of the following season, having failed to deliver silverware? Probably not. Klopp would have been right in the frame but that ship has sailed now after he was snapped up by Liverpool following the sacking of Brendan Rodgers. When Mourinho left in 2007, Avram Grant stepped out of the shadows to succeed him but it was regarded as the work of Chelsea's experienced players to guide them to the 2008 Champions League Final, where they lost to Manchester United on penalties. So would Chelsea seriously consider sacking Mourinho then going down the "interim manager" route that brought them success before? Guus Hiddink won the FA Cup in 2009 after a spell as temporary coach following the sacking of Luiz Felipe Scolari, while Rafael Benitez won the Europa League in 2013 after replacing Roberto Di Matteo, who had won the Champions League only six months before his dismissal. Hiddink, 68, is available now but is damaged goods after a failed spell in charge of the Netherlands. He is not likely to figure in any potential discussions. The names of former manager Andre Villa-Boas and ex-Liverpool boss Rodgers, who worked as a youth coach at Chelsea, have also been mentioned but they cannot carry any real weight. This surely still leaves Mourinho as the strongest option in a fight he insisted he was ready for, even after defeat by Liverpool. New Liverpool manager Klopp described himself as "The Normal One" when asked to compare himself to "The Special One" Mourinho on the day of his appointment. The problem for Mourinho is that defeats like this are now becoming normal - and they must improve. While Klopp was a blur of animated activity in the technical area throughout Saturday's game, Mourinho cut a subdued figure, only bursting into life at perceived injustices. Mourinho gave fourth official Lee Mason a quizzical glance and a few words when Klopp confronted him face-to-face on several occasions, clearly questioning what would happen if he behaved in a similar manner. He was also visibly infuriated, with great justification, when Liverpool's Lucas escaped a second yellow card for a blatant trip on Ramires having already been booked. As Klopp high-fived his backroom staff after Benteke made it 3-1, there was almost an air of desperation about Mourinho as he clapped his hands in an attempt to galvanise his beaten players - but like a hapless driver trying to start a car with a flat battery. He then stood with his hands in his pockets as the formalities of defeat were played out. Mourinho side-stepped a series of questions about his future in his immediate after-match interview - but showed small flashes of the old defiance in a later briefing, insisting he will fight on and he does not expect to lose his job. As history tells us, that is a matter for Roman Abramovich.